One of the most frustrating things about WooCommerce is the inability to change your order emails to fit your brand or voice. While you can completely change the way your storefront looks using a new theme to represent your brand, the order emails in WooCommerce are generic and difficult to customize. 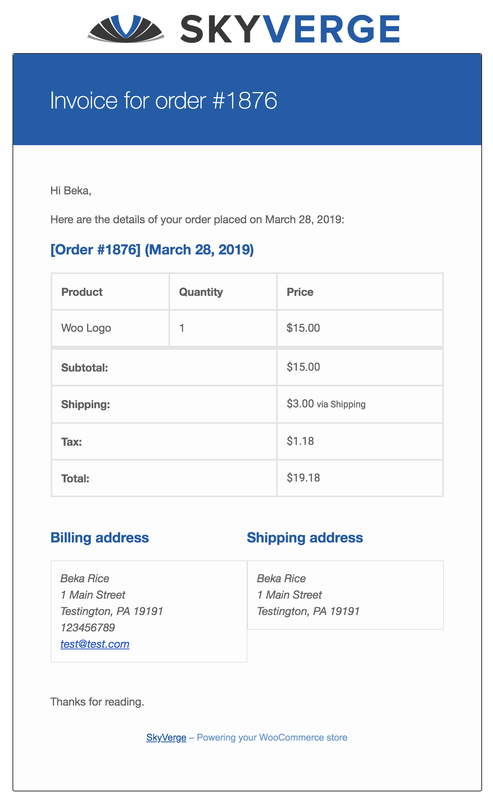 For a newcomer to WooCommerce, this is often jarring: how can I adjust my WooCommerce receipt email to add new information or a thank you note? How can I change my order completed email in WooCommerce to set expectations on shipping timelines? It’s disheartening to realize the answer: you can’t, really. Not without digging into the code — you can change the subject and heading, and that’s it. This means that the transactional emails your store sends are often a wasted opportunity: they’re generic and only contain basic information about the order, with no ability to engage the customer further or cross-sell other products. This is a huge miss for many stores. Order emails have substantially higher transactional value in comparison to bulk mailings, and they’re far more likely to be opened, read, and clicked by customers in comparison to bulk mailings. Customers open receipts about 70% of the time, so you shouldn’t waste an opportunity to increase engagement with such an often-read email. There is great news, though: it doesn’t have to be this way! 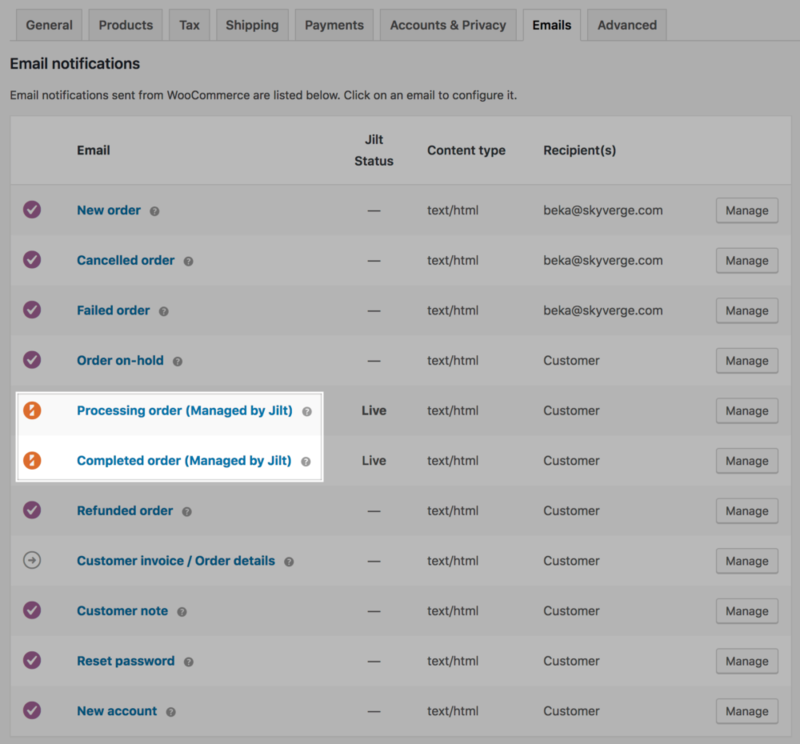 We’ve written about customizing WooCommerce order emails before to improve your email appearance, but I’m happy to say we’ve launched a complete order notification replacement in Jilt! 🎉 You can now send your transactional emails through Jilt for customizable order emails. Personalize your email content so that it includes information customers care about (like recommended items or how to get in touch with you). Segment your customers so that they get information relevant to them or their order. Jilt helps you address both of those needs in your transactional emails by making the content accessible and easily editable, along with letting you send different versions of your order notifications. It will even take care of disabling the corresponding order emails in WooCommerce when managing them in Jilt to avoid duplicate emails. Finally, your order email content is editable! Use the visual editor in Jilt to build receipt emails, shipment notifications, and more. 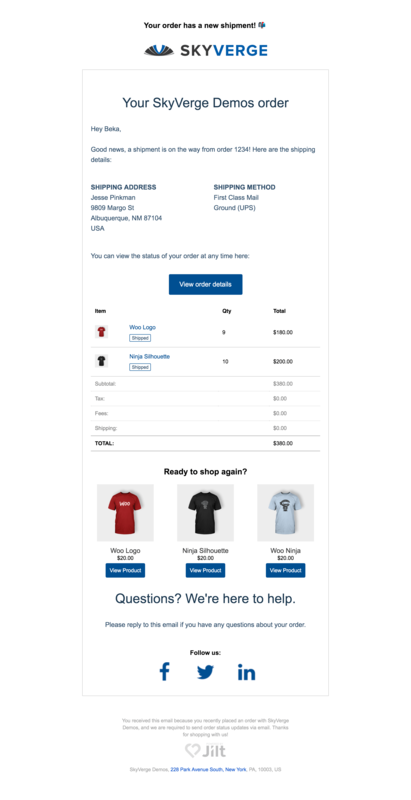 You can personalize your email content by including customer information in the email (by using liquid merge fields) along with order details. 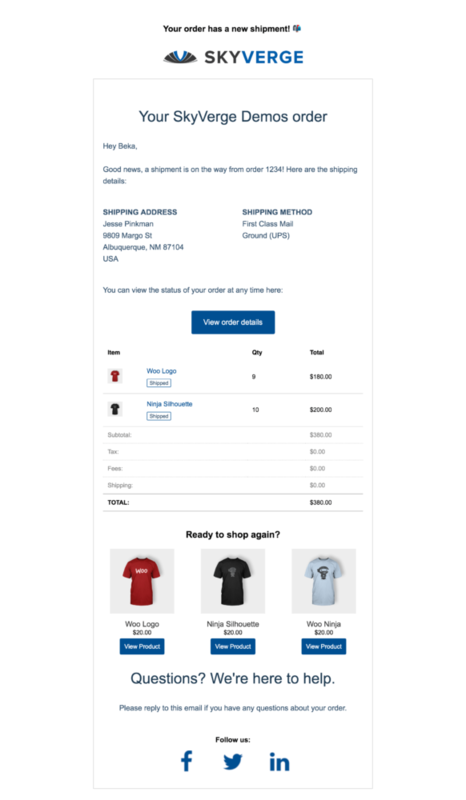 You can even include recommended items in the email to upsell customers, or include dynamically generated discount codes to provide an incentive to purchase again. Is the order being shipped internationally? You may want to set different expectations for shipping timelines vs a domestic order. Want to include more cross-sells for free orders? You can do it. 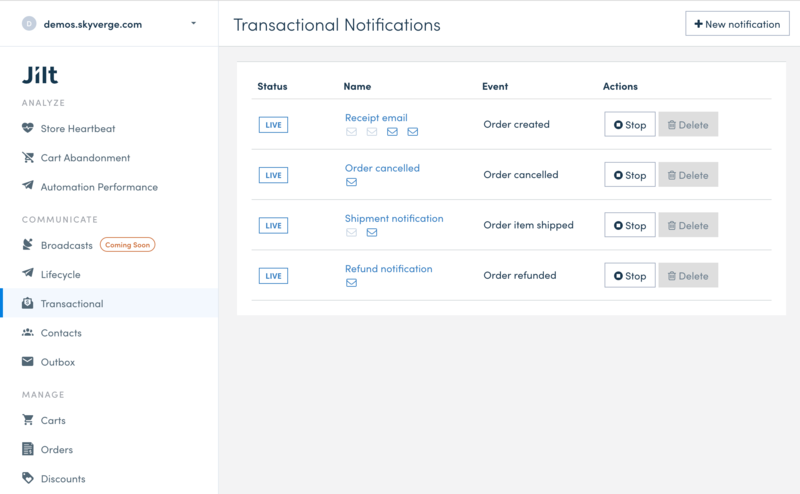 We built the transactional notifications in Jilt to allow for different versions of every order notification you send. Let’s use receipts as an example — I can create different versions of my receipts for international orders, free orders, and unpaid orders. If a particular order matches one of these templates, great! It will receive that email. Otherwise, it will receive my default receipt instead. Every order notification in Jilt is structured this way: you can send different versions of a shipment notification, cancellation notice, receipt, or refund notification (coming shortly!). This gives you the ability to send richer, personalized transactional emails to all customers, making the most of the opportunity to engage or cross-sell other products in your store. Finally, what sort of impact do your emails have on revenue? You can view reports for every notification you send through Jilt to see how much revenue that notification generates, along with how often customers engage with that email. 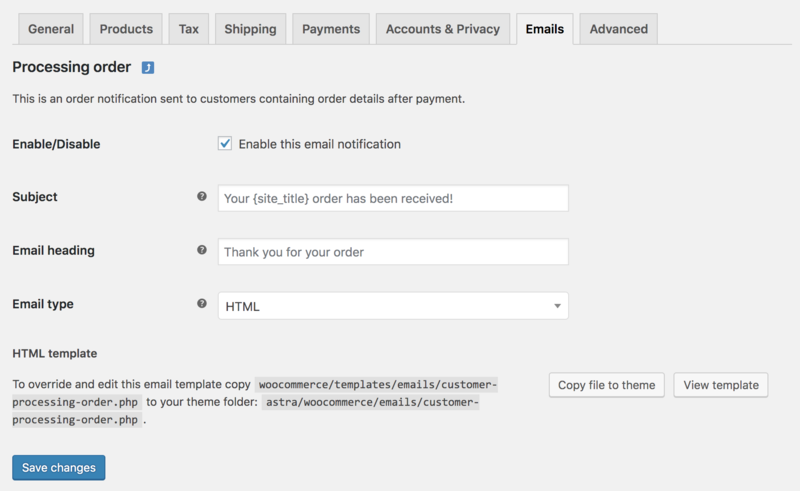 I’m super excited to bring vastly improved order status emails to WooCommerce stores, making it much simpler to customize and personalize your order notifications. Ready to give it a spin? 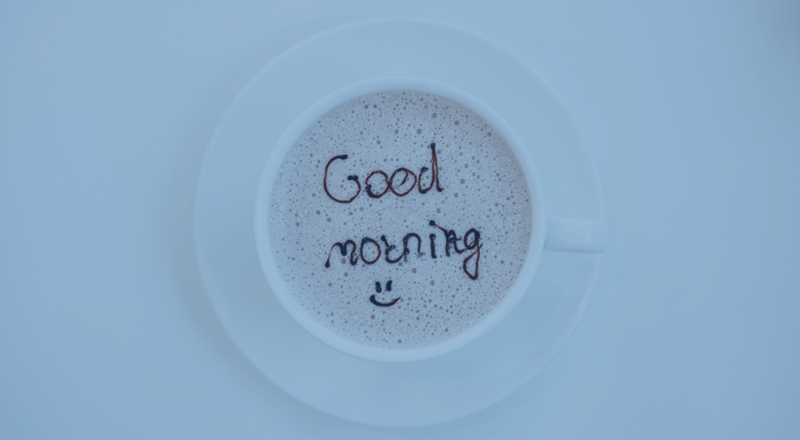 You can get started with Jilt here. I’d love to hear about how you’ve changed your order emails!